Travelling from Tennant Creek to Katherine you will experience an amazing change in the landscape of Australia’s interior. The open grasslands and semi-arid environs meld into the vegetation and geology synonymous with the tropics. From dry rivers to big rivers, enjoy the transformation while taking in the attractions and townships along the way. 74 kilometres north of Tennant Creek is a monument marking the point where explorer John McDouall Stuart turned back on his expedition to cross the continent in 1860 after a hostile encounter with some local Aboriginal people. It has since been appropriately known as Attack Creek. 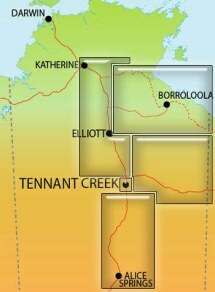 Elliott, 255 kilometres north of Tennant Creek, is the Barkly region’s second largest town and was developed during World War II. Lake Woods nearby is a large body of permanent water in an otherwise largely arid region and is a haven for many bird species.